Is California’s coastline becoming a radioactive dead zone? Unless you were one of the 150+ thousand people living close to the Fukushima disaster who were evacuated in 2011, Japan’s nuclear crisis might seem far away. Remember, though, that radioactive waste spewing from the plant by the ton has been working its way into the Pacific Ocean, and from there, on to the rest of the planet. According to new research from the Centre of Excellence for Climate System Science, the radioactive ocean plume from the original disaster will reach the west coast of the U.S. by early 2014. As if Fukushima wasn’t enough, electricity generation at SCE San Onofre ceased in January 2012 due to leaks in its steam generator, reportedly “without any release of radioactive isotopes.” More than a year later, rescue centers from Long Beach to San Clemente were overwhelmed with starving sea lion pups, which soon totaled more than 3,000 cases. Found beached in front of the now shuttered San Onofre nuclear power plant, the carcass of a California sea lion was remarkable, for being an adult specimen. So far, throughout a four month crisis for marine mammals along the Southern California coastline, all of the 3,000-plus sea lions, elephant seals and harbor seals suffering severe malnutrition have been pups deprived of breast milk from their emaciated or missing mothers. A quick scan with a dosimeter revealed that the dead sea lion was radioactive. More careful measurements disclosed a shocking 0.48 microsieverts in the heart and liver region. If you haven’t visited a California beach lately, you probably wouldn’t know that the rocks are unnaturally CLEAN – hardly any kelp, barnacles, sea urchins – and the tide pools are scaringly devoid of crabs, snails and other scurrying signs of life- especially compared to ten years ago. 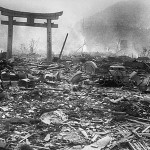 Never Forget Hiroshima and Nagasaki! Time To Toss The 9/11 Blather!